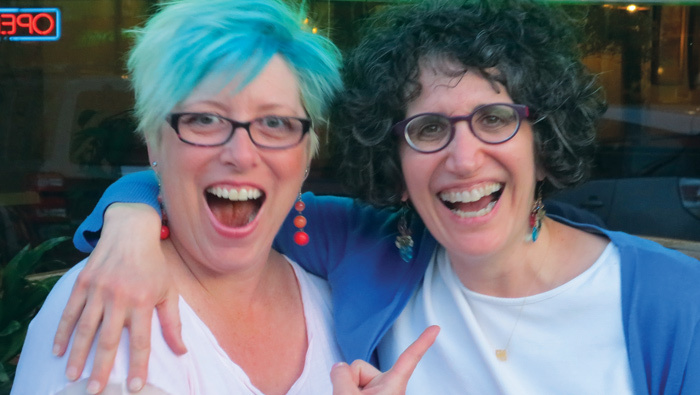 Now that O’Connor’s in Multnomah Village has closed, Betsy Kauffman and Joanie Quinn are moving their Spilt Milk comedy show (minimum age 18) to the Lake Theater & Café in Lake Oswego. Betsy was featured in Oregon Jewish Life in November 2015. Doors open at 5:30 pm, show starts at 7. Come early to eat, come to drink, come to soak in the view from the lakeside deck … and come to laugh ’til you cry! Lake Theater’s beer and wine lists represent the best in the industry, and are curated with care; and their cocktails feature seasonal ingredients mixed with never-bottom-shelf spirits. And the pizzas! New York style! Food and drink can be enjoyed in the theater. The theater features cabaret-style seating on the main floor and traditional velvet seating in the balcony. We can bring the show to almost 100 people at a time! Designed by celebrated local architect Richard Sundeleaf, the Lake Theater first opened its doors in 1940, charging 25¢ for admission.